Nick Pafko knows he can't be a professional boxer forever. But he never guessed it would end so quickly, and so wrong. Broke and unemployed, Nick has little choice but to call a number given to him by a friend. On the other end? Scott, a washed-up B-movie actor who runs a so-called massage parlor looking for somebody desperate enough to work security. Jenny Yee doesn't really mind massage, until the day she finds her coworkers robbed and assaulted. Fearing for her safety, she resolves to never work without security again. With mounting expenses, she knows massage is the fastest way to get paid. When an old massage acquaintance calls Jenny to ask her to work for Scott, she agrees--and before long, she's the top earner. Scott is an arrogant moron, but he's harmless compared to the thug he calls "friend"--Onus Dupree. When DuPree decides to rob Scott's massage joint, it's the perfect opportunity to beat up Nick and take advantage of Jenny. Can Nick stay true to his promise to protect Jenny? Can he protect himself? John Schulian was a nationally syndicated sports columnist for the Chicago Sun-Times before moving to Hollywood to write and produce TV dramas. 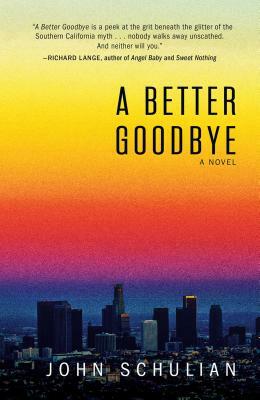 A Better Goodbye is his first novel. His short fiction has appeared on the websites Thuglit and The Classic and in The Prague Revue. He lives in Southern California.